Computer-based learning and personalized learning are often faulted for taking the teacher out of the equation too much, but in the case of Ingenuity Prep, they have been employed to the opposite effect. Ingenuity Prep serves 496 students in grades pre-K-3 to 5, with plans to expand to eighth grade. There are two to three classes per grade, each with between 25 and 30 students (24 in preschool). Each preschool classroom has three teachers, and in kindergarten and above, each classroom has two lead content area teachers, one specialized in math, the other in literacy. There’s also a literacy apprentice who teaches across two classrooms. When students are in literacy class, the literacy-lead teacher and the apprentice co-teach the content. When students are in math class, the lead math teacher from one classroom comes to the other classroom for co-teaching support. The school hosts resident teachers from the Urban Teachers program, and school leadership says the partnership has been integral to making Ingenuity Prep’s group model function. Resident teachers already have a bachelor’s degree, but the program allows them to work toward a master’s in education, including certifications in special education and their specific content areas. 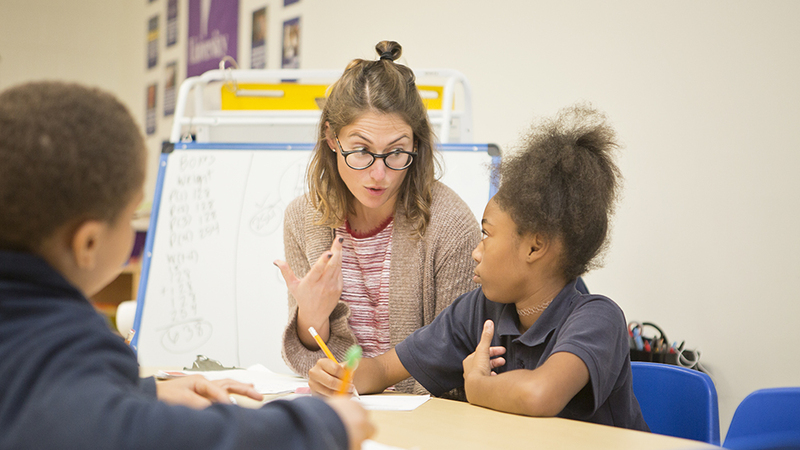 After the first year, Urban Teachers places its residents as full-time paid staff members in schools — usually the ones where they had already been teaching — where they can finish out the program’s remaining three years. Ingenuity Prep currently has 11 resident teachers. 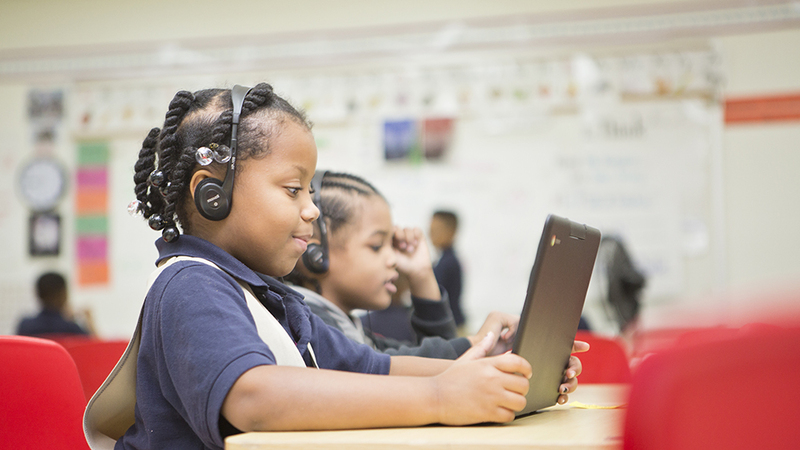 Ingenuity Prep incorporates computer-based learning into the curriculum, a practice known as blended learning. In kindergarten and above, each student has access to a Chromebook and a student web portal, which contains different online educational programs like Lexia Reading and STMath. Teachers blend the digital content into the curriculum to target individual student needs and provide students with independent practice in subject-area knowledge. Aside from the benefits of exposing students to blended learning, the goal of Ingenuity Prep’s learning model has always been more one-on-one time between teacher and student. Students spend less than 10 percent of their time learning in groups larger than 15 students. Maud Cooke-Nesme, a kindergarten literacy teacher, believes the computer-based learning has been important in achieving this. “The use of technology really helps us as teachers because it gives us the ability to have the differentiated time in smaller groups,” she says. The implementation of the Ingenuity Prep model looks slightly different depending on the grade level. In pre-K classrooms, play-based learning takes the place of computer-based learning. Students spend much of the day in “centers,” where they choose from a variety of activity stations like art, music and movement, and dramatic play — in which the preschoolers take on the role of adults in everyday situations and careers. As the students rotate through the centers, the lead teacher pulls out small groups to give them formal, personalized instruction in literacy and math. There are also some large group activities, like “Mindfulness,” a short time after recess during which students practice guided deep breathing and feeling their heartbeats. From kindergarten to fifth grade, the Ingenuity Prep model for literacy hits its stride. Students spend a significant amount of time in small groups assembled by relatively similar ability level, rotating through different learning activities, from direct instruction to guided practice and independent, computer-based practice. While there’s teacher flexibility in the model’s implementation, all classrooms must have certain components essential to its success: a classroom library, a carpeted open space, a large group instruction area, and small group instruction spaces. In a kindergarten classroom, three groups are rotating through different literacy practice activities. Six students sit in two rows of desk, facing the front of the room, as they practice reading skills using Lexia on their Chromebooks. These students are on different levels from one another, progressing through the program at their own pace. A second group of eight students sits at a semi-circle table, facing lead teacher Amber Morales. Morales is conducting guided reading, and she’s targeted both the text and the learning objective to this group’s specific skill level. The students are practicing sight words, with a focus on the word “where.” They follow along, tracking the text with their fingers, as Morales reads aloud and asks them questions about the story. The last group of 10 students is on the other side of the room in a much more traditional classroom setup. They’re in rows of desks, facing the teacher and the board. Here, Urban Teachers resident Michaura Rivera is using direct instruction to teach phonetics and writing. Students practice drawing their letters on individual whiteboards, and Rivera monitors their progress. In a second-grade classroom, there are still designated spaces for small and large group instruction; however, because these students are more capable of self-monitoring their behavior than those in kindergarten, the library area and open space are larger, creating a cozy, independent reading environment. In this class, one group of students is working on computer-based programs. Another group is around a table, working on a guided writing project with the lead teacher. And the third group of students are lying on the carpeted space in the library area. They’re practicing independent reading; they’ve chosen books from the shelf marked at their current reading level, as well as two books from the level above. In a fifth-grade classroom, the setup looks more traditional, with the majority of the desks facing the front of the room and the teachers. There’s a Chromebook on each desk because students are working on writing in a large group activity. There’s still an area for small group instruction and a library area with open space. However, both are much smaller than in the lower grade levels. Overall, math lessons schoolwide involve more large group instruction than literacy; teachers want a more heterogeneous group in terms of student ability level so that struggling students can learn by watching stronger students solve problems. Classes still incorporate the rotational model and blended learning, but often the lead teacher will perform direct instruction with a larger group while the assisting teacher pulls out small groups of students who need extra help. School leadership admits that balance wasn’t always there; they’ve been very intentional about creating it. They use surveys to measure the adult culture in the building. They’ve allotted extra time for planning during the school day. And they have a robust teacher-coaching program in which school leaders observe teachers once a week. The coaching also helps create a uniform culture of high expectations. This embedded culture of coaching develops a special relationship between leadership and teachers. All of the instructional leaders were once teachers, and many were once teachers at Ingenuity Prep. JaQuan Bryant, the co-principal of kindergarten through second grade, came to Ingenuity Prep as a first-grade teacher. He believes he benefited greatly from the coaching. Ingenuity Prep has six full-time behavioral support specialists. If a student causes a disruption in class, the teacher texts one of the specialists, who then removes the student. The aim is to return the student to class as quickly as possible. However, there is a “reset room,” which students call behavioral support, for those who aren’t ready to go back to class immediately. There, students reflect on their behavior. Ninety-seven percent of Ingenuity Prep students are African-American, and the Office of the State Superintendent of Education has designated 60 percent of its students as economically disadvantaged. The state office also labeled 66 percent of students “at risk,” meaning they are more likely to drop out based on their receipt of public assistance, receipt of food stamps, involvement with the D.C. Child and Family Services Agency, homeless status, or being older than expected for their grade. Many of the school’s students experience trauma at home, and their behavior is not always a reflection of what’s going on in class. Every teacher at the school has been trained in crisis intervention management. Student and family support specialists, special education teachers, the speech therapist, and counselors also complete a deeper-level training. There’s also a full-time social worker and psychologist, and there are no security officers. The school screens staff during hiring to ensure that their values align with the school’s mission to educate low-income students with empathy and understanding. Back in January 2012, around the time Stoetzer and Cuny were talking about starting a school, the Illinois Facilities Fund published Quality Schools: Every Child, Every School, Every Neighborhood, an extensive analysis of public school locations and performance in Washington, D.C.
After categorizing the District into 39 neighborhood clusters, the authors of the report concluded that to provide all public school students, both district and charter, with a high-quality education, the city would need to add an additional 39,758 seats in high-performing schools. Ten neighborhood clusters – three of them located in Ward 8 – would need 68 percent of those seats. After reading the report, Stoetzer and Cuny intentionally opened Ingenuity Prep in Bellevue, a Ward 8 neighborhood in the center of the cluster that the Illinois Facilities Fund had declared the District’s highest-need area. Ward 8 needed 10,087 additional quality seats, and the Bellevue cluster alone needed 5,969 of them. Eighty percent of Ingenuity Prep students live within a mile of the school. Ninety percent live in Ward 8, and 95 percent live east of the Anacostia River, in D.C.’s poorest neighborhoods. On the 2018 Partnership for Assessment of Readiness for College and Careers (PARCC) exams, 38 percent of its students tested proficient or above in English and 34 percent in math. The two neighborhood elementary scores had pass rates of 8 and 6 percent for English and 13 and 9 percent for math. When compared with the other 35 schools in Ward 8, Ingenuity Prep ranks second highest in terms of PARCC scores, with student scores in the 95th percentile for the ward. Of the District’s 113 schools where more than 50 percent of the students are economically disadvantaged, Ingenuity Prep’s test scores ranked seventh. In general, D.C. schools with more at-risk students have lower student proficiency scores than the citywide average. However, on the 2018 PARCC exams, Ingenuity Prep students scored slightly above the citywide average for both math and English. Their combined proficiency scores were in the 74th percentile citywide, and student growth scores were in the 92nd percentile. Despite its success and the overwhelming need for more seats in high-performing schools, Ingenuity Prep cannot replicate under the current regulations of the D.C. Public Charter School Board, the District’s charter authorizer. To do that, the board requires that a charter school have a tier-one ranking on its performance measurement framework. Ingenuity Prep currently has a tier-two ranking. When judging school performance, the charter board compares charters citywide, which presents difficulties for schools like Ingenuity Prep that serve a larger percentage of at-risk students than many of their charter peers. “It’s a more challenging experience on this side of the river, and I think our colleagues who run high-performing charter schools elsewhere would agree with that,” says Stoetzer. For instance, Ingenuity Prep has one of the lowest in-seat attendance rates in the city for charters, at around 89 percent, slightly below the 90 percent citywide average for all public schools. However, the two traditional neighborhood elementary schools, which serve similar student populations, have attendance rates of 89 and 92 percent. There’s a high correlation between the number of at-risk students and absenteeism, according to Ingenuity Prep’s leadership. Because the school is located 1.5 miles from the closest Metro station, about one-third of students take the bus, which is not as reliable as the Metro, and cold winters also negatively affect attendance among those students who walk from either home or the Metro station. Moreover, many of the students come from single-parent households with multiple siblings. Often, when one child is sick or has a doctor’s appointment, the parent will keep all of the children at home because it’s not easy or convenient to take the others to school. Ingenuity Prep has done a variety of things to increase attendance: free Metrobus passes to parents (in D.C., kids ride for free), internal incentives for students, phone calls home to students chronically absent, and listing the amount of instructional time lost because of absences on each report card. Regardless, attendance rates have increased by only 1 percent. “I respect and appreciate that the board wants to hold a high bar for low-income students, but I think demanding that a school be tier one to replicate ignores the reality of the limited options available to kids in neighborhoods that are historically underserved,” says Stoetzer. Correction: Resident teachers with the Urban Teachers program are eligible for various forms of financial aid. An earlier version of the story included incorrect information about tuition reimbursement by Urban Teachers.